Our large selection of beautiful batiks are on sale 20% off Saturday, July 15 - Friday, July 21. 25% off for our Barefoot Club Members! yardage, 2 1/2" strips, 10" squares, 6" strips - it's all on sale! Cash in on your Barefoot Club discount today and tomorrow, July 15. Barefoot Club members 20% off their total purchase and 25% off batiks! Two days of quilting fun! Your favorite vendors featuring booths filled with quilting fabrics, knitting yarns, books, patterns, embellishments and more. Sewing machine and long arm quilting machine dealers, too! 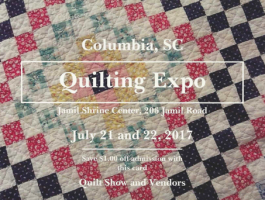 Don't miss this fantastic quilt show and vendor expo! Join The Woolies this Sunday, July 16, at 1:00 pm and enjoy an afternoon of good company while working on your hand applique wool projects. This group gathers on the third Sunday of every month. Enjoy an afternoon of good company while you ply your needle! There is no charge and no reservation required. Tomorrow night's sew has been cancelled due to lack of participants. We'll try again next month so give us a call and let us know you'd like to come (704-821-7554). Bring whatever you're working on; sew starts at 3:30, we order out for dinner and finish up around 8:30. Learn to make applique seasonal wallhangings, one month at a time! 12 Seasonal wall quilt projects in one booklet, including full sized patterns! These are quick and easy applique designs, great as gifts (but keep some for yourself!). 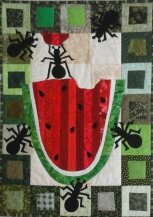 The July class will work on these hungry ants to hang at home in August. Class meets on the third Saturday of every month - come to as many or few as you like! September 13-16, 2017, Only 4 spaces left! Join us for a relaxing 3-day getaway in the picturesque mountains of North Carolina. No cooking or cleaning, just fun and friendship-you deserve a little pampering! We call it the Pajama Party because you can roll out of bed and come to quilt class in your jammies! And the comfortable, beautifully decorated retreat is outfitted especially for the needs of quilters. All retreat supplies are 15% off at Quilt Patch Fabrics! For more information contact deborahquilts@hotmail.com. This bold geometric design will add extra sparkle to your home. If you love to make flying geese, you'll LOVE making this quilt! 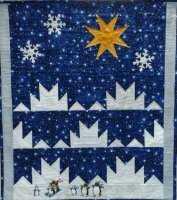 Create your own winter wonderland as you sharpen your triangle skills the Quilt In A Day way! $125 class fee includes kit with background & binding fabric, Magic Mountain pattern, snowflake and penguin appliques, Triangle In A Square ruler, and the Delectable Mountains Quilt In A Day book--all in an Eleanor Burns' Stripper vinyl zippered project bag. 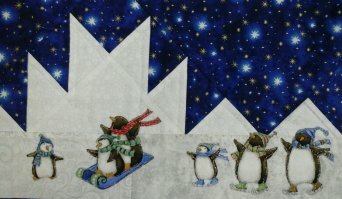 Go to quiltpatchfabrics.com/classes.htm for more details on all of our classes. To register call us at 704-821-7554. 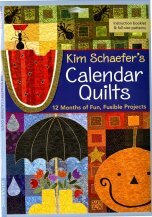 Quilt Patch Fabrics has a new email address! Please change your records so we don't go into your spam folders.